“Spring is a time of renewal and the magazine of the College of Agriculture and Life Sciences has undergone some exciting changes, including a new name. periodiCALS will provide the same news, updates and features you’ve come to expect, but will offer more in-depth content focused on a central theme, allowing us to showcase how the college’s breadth and depth of disciplines complement one another. 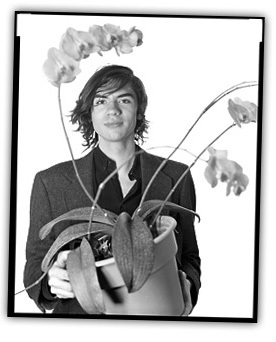 Senior portrait of plant sciences major Alfonso Doucette (right). 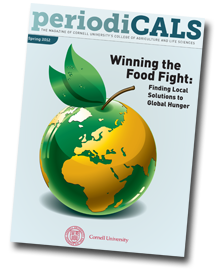 Bringing Cornellians Closer to their Food – Features the USDA-funded Food Dignity Project, including Cornell participants Laurie Drinkwater and Scott Peters, tells of the work of the Cornell Small Farms Program with established and beginning farmers, and lauds the efforts of staff at the Homer C. Thompson Research Farm in Freeville to provide four acres of sweet corn and squash to dining halls as well as food for local pantries — 174,000 pounds in 2011. New Strawberry Varieties – From Courtney Weber’s berry breeding program. The (Not So) Sweet Smell of Success – Recaps the flowering of ‘Wee Stinky’ — the titan arum that’s part of the Department of Plant Biology’s Liberty Hyde Bailey Hortorium collection, including web exclusives such as time-lapse photography of the plant. Late blight is a “community disease.” It is very destructive. (It led to the Irish Potato Famine.) 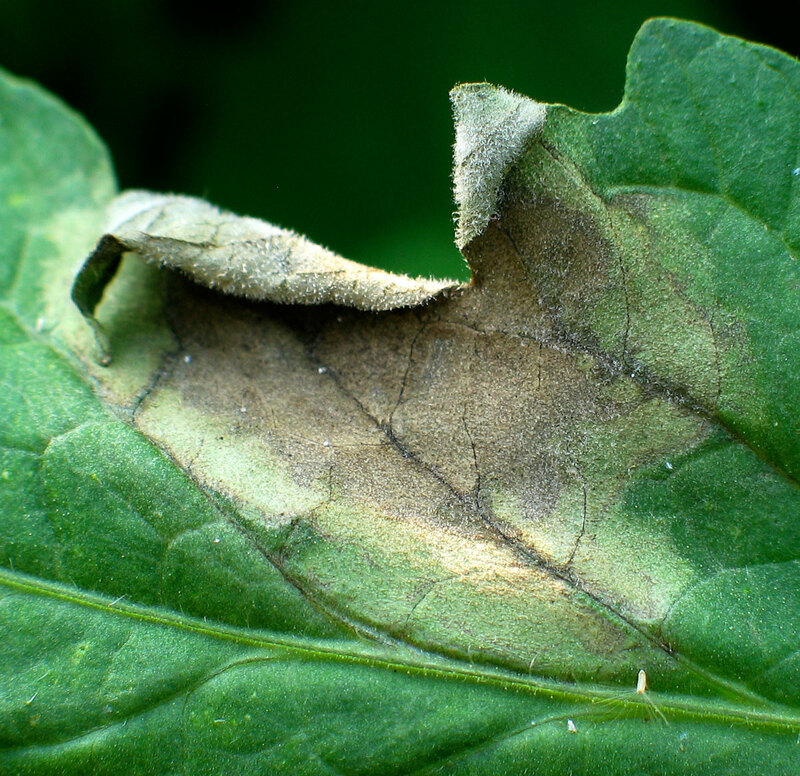 It is highly contagious among plants. And the pathogen produces many spores easily dispersed by wind. See also Michelle’s account of her visit to Ithaca. There’s no magic wand to fix our educational system. Instead, it will take exceptional teachers and approaches designed to meet the needs of all students. That was the key message delivered by Michelle Shearer, 2011 National Teacher of the Year, in an address to more than 150 students and educators April 24. The evening program was part of a day-long series of events organized by Bryan Duff, lecturer in the Cornell Teacher Education program in the Department of Horticulture, that had Shearer working with educators and science faculty at Ithaca College in the morning and with Cornell education students in the afternoon. This wider access does not require watering down the chemistry. Instead, teachers need to be more creative in providing academic supports to bring students up to high expectations. Social support is key, too. Teachers who know their students’ strengths and interests and make all students feel valued more effectively encourage the persistence needed to master challenging content. That requires exceptionally talented teachers, Shearer points out. 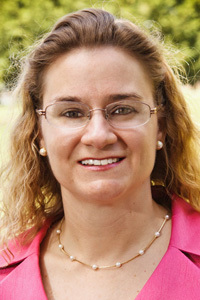 While a science major at Princeton University, she often felt pressure to “do more” than teach high school. Shearer challenged her Ithaca audiences to speak out against the biases that devalue teaching that pervade higher education and society. What could be more important and challenging than dedicating your professional life to promoting other people’s success, she asks? Co-sponsors of Shearer’s visit were the Cornell Teacher Education Program, the Ithaca College Department of Education, the Cornell Employment & Disability Institute and the Wells College Education Program. In a related Ithaca Journal video, Cornell Orchards manager Eric Shatt explains how cold weather damages apple flowers. 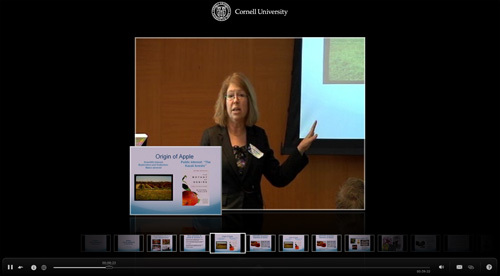 If you missed Susan Brown’s presentation Apples: From Johnny Appleseed to genomics at the 1st Annual Cornell University Graduate Student Plant Breeding Symposium April 13, it’s available online. Other presentations from the symposium are also available here. Come view a demonstration garden that promotes ecological gardening by including different varieties of vegetables, herbs, and flowers. 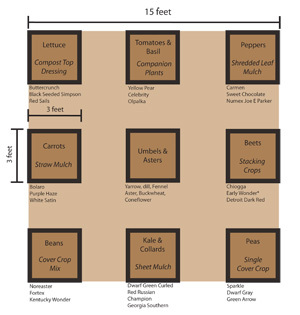 We’ll be having an opening Thursday, April 26, 2012 from noon to 1 p.m.
Come view the new garden and learn about the Vegetable Variety Trial conducted by Cornell Garden-Based Learning. Light snacks and cider provided. The garden is located along the west side of the Plant Science Building. 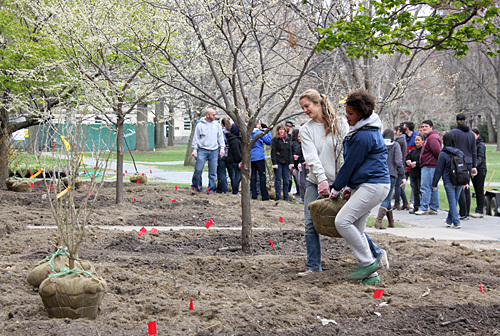 Installing the Garden on Campus – 2012 Veg Variety Demo from CCE Horticulture on Vimeo. From Cornell Chronicle article, 4/19/2012. 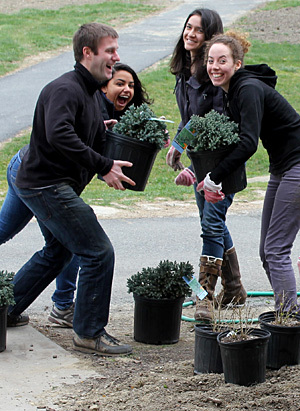 The Art of Horticulture (HORT 2010), taught by Marcia Eames-Sheavly (right), is one of 13 courses selected as University Courses for the 2012-2013 academic year. University courses are designed to teach students to think from the perspectives of multiple disciplines, across departments and among diverse fields of study. They foster intellectual discovery, promote debate and address complex issues. Art of Horticulture students with sod cow sculpture outside Morrison Hall in 2006. The landscape outside the Computing & Communications Center on the Ag Quad got a major upgrade, thanks to students in Nina Bassuk‘s and Peter Trowbridge‘s course, Creating the Urban Eden: Woody Plant Selection, Design, and Landscape Establishment (HORT/LA 4910/4920). Earlier, the class tore down the pair of sod sofas created in the front of the building by Marcia Eames-Sheavly‘s Art of Horticulture class last fall. They spread the compost used as the foundations of the sofas to help improve the soil for the trees and shrubs they planted Tuesday. This spring, the ‘Urban Eden’ class is also taking on a major project in the courtyard at the School of Industrial and Labor Relations. Because of the sheltered location and shifts in the USDA’s hardiness zones, that planting will feature many species more often found in landscapes farther south. More about that later. Moving balled and burlapped trees into position for planting. 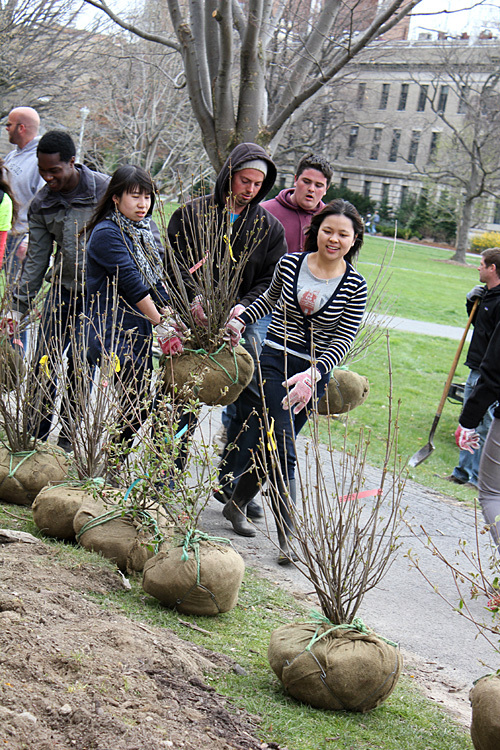 'Urban Eden' students move shrubs into place outside the CCC building on the Ag Quad.